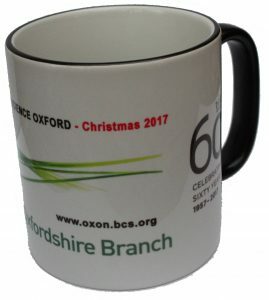 Posted December 28, 2017 by admin & filed under BCS Oxfordshire, Events. As part of our endeavour to reach out to the community, we try each Christmas to include a wider and younger audience. We advertised this evening as a fun family event, suitable for 10+. There were 46 attendees of whom 15 were children mostly in the 11 to 16 age group. It was a resounding success, with children, adults, novices and experts alike enjoying the various activities on offer. All feedback at the end of the evening was excellent. The evening had a computing bias, of course, and was based around the BBC Micro:bit. This is a small microcontroller – it has a pixilated ‘screen’ on the front made of 25 LEDs. Two buttons you can use to control it and loads of other interesting features. In an ambitious program, up to one million BBC Micro:bits have been delivered free to 11 years olds in schools in England, Scotland and Wales. Science Oxford hosted us at their Oxford centre, we had The Pod and a basement area. Three members of their staff provided the backbone of the activities. In The Pod area we had the Micro:bit challenge, the Micro:bit needed a bit of simple coding to bring it to life. This was very popular with adults too. There was a separate raffle for a Micro:bit for an adult and a child. 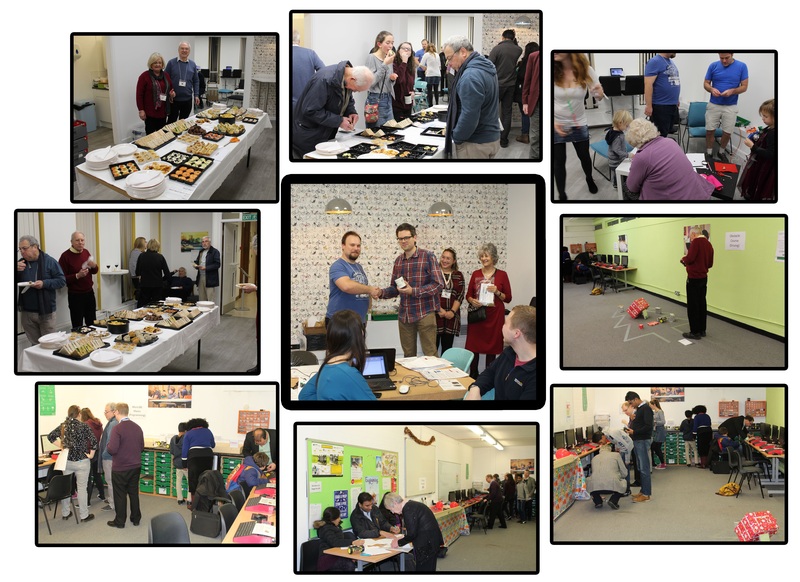 We had an evil competition – for experienced coders, a Micro:bit had been programmed to broadcast a Christmas message, the challenge was to code a Micro:bit as a receiver and decode from Morse code. The most ‘elegant’ code won a commemoration BCS mug. And a treasure trail, picking up key words distributed around the two floors. This was really for children but adults took part also to gain a raffle ticket to win a commemoration mug. In the basement was the robotics obstacle course. 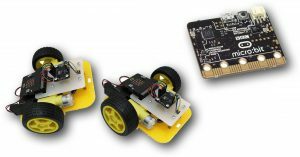 A robotic car, built from a kit, with a pre-programmed Micro:bit in the car and a Micro:bit as the hand held controller. The seemingly simple course was in the shape of a Christmas tree, laid out on the floor with presents as obstacles, the objective was to get to the star as quickly possible with time penalties for mishaps. There was a practice slope. A young girl won the prize, a robot car kit. There were a set of screens for people to work out how to programme the two Micro:bits to control the robotic car. That was very busy too. Another activity in the basement was to design, on paper, an amusing Micro:bit animation. The winner designed a twinkling star and was awarded a commemorative mug. A buffet, with mulled wine for the adults, was served in the reception area. Science Oxford had spare kits and Micro:bits available for sale and did a brisk trade.